We returned to Managua on December 30 intending to rent an SUV at the airport and drive to San Juan del Sur the following day. Don't pass up any rental on December 30 in Managua. After passing up the chance to rent a four-door Toyota truck, we found that every rental agency in Managua was rented out. That's right, not one rental car to be had in the entire city, for a while at least. After several hours of looking, Max called the airport and we were told that there was one Mitsubishi Galloper that had been turned in. Because we were having as much trouble trying to get reservations in San Juan del Sur, Max and Margaret went to the airport and Sherry and I went with my uncle to leave a deposit at a hotel in Managua that had a vacancy at its franchise in San Juan del Sur. After getting the rental and the reservations taken care of, we went to Catarina with my aunt to pick up some plants at some roadside nurseries. Afterwards we went to the "mirador" to check out the view of the Apoyo caldera. Apoyo "mirador" (lookout) at Catarina. Volcan Mombacho is on the right. This would be a great place to watch a sunset if the Earth rotated in the opposite direction. Maybe one day I will get up early enough to see a sunrise over the "lagoon." After a fried chicken dinner in Masaya and a good night's sleep, we left for San Juan del Sur on December 31. 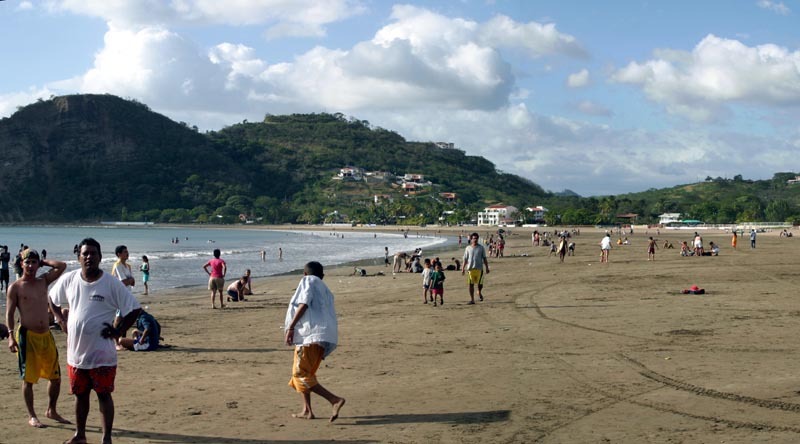 My impression of San Juan del Sur as an out-of-the-way tourist destination and otherwise sleepy fishing village was confronted with the college spring break atmosphere that San Juan del Sur holds during the Christmas and New Year holiday. Pizza and fried chicken trucks drove in and all the restaurants were full all day long. The crowds were manageable though. The photo below shows the population of the beach during the afternoon of New Year's Eve. The above photo doesn't really show the extent of the crowd, but for those who have been to San Juan del Sur in the off season, you know this is crowded. The town also enjoyed a night long fireworks show. Bottle rockets in Nicaragua are about 3 feet long and a the report is about the same decibel level as a 20 gauge shotgun. They are like M80s on long sticks. On New Years Eve, the fireworks went on all night. We spent New Year's day on the beach and sampling the ceviche in the local restaurants. We also went up to Piedras y Olas, Chris Berry's hotel/development, and checked on whether his sailing trip was full for the following day. Luckily there was room for us. 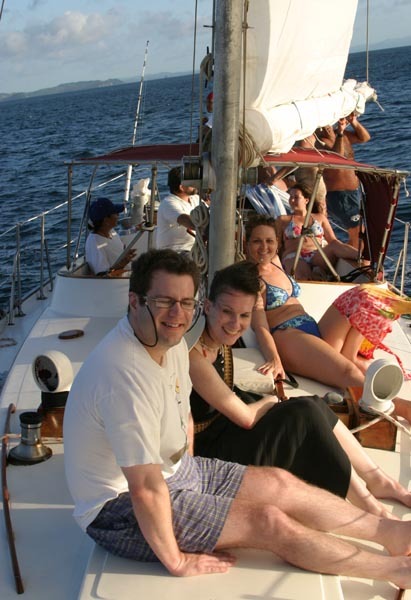 If you ever go to San Juan del Sur, you should definitely go on a sailing trip on the Pelican Eyes. 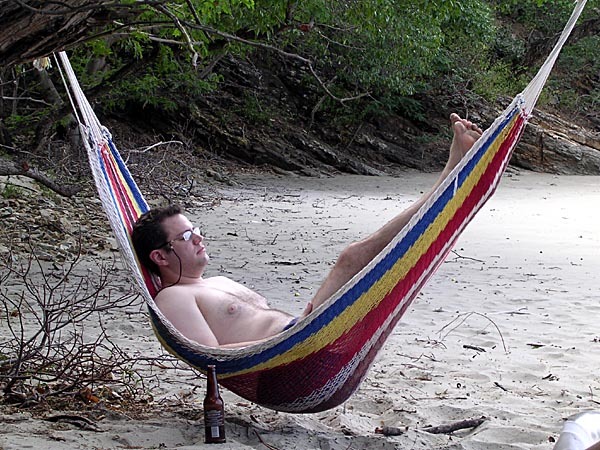 You set out from San Juan del Sur and sail for about two hours south to a beach near La Flor. You will likely see turtles swimming off the beach, waiting for nightfall to come ashore and lay their eggs. Once you arrive at the beach, everything is already set up to cook the fish you caught along the way (I caught some sort of Jack). For the whole trip, which lasts from 9:00 a.m. until about sunset, beer, excellent food, mixed drinks and excellent service are provided for around $50 per person. View from under the tarp while the crew prepares lunch. All the beer is in the blue cooler. After lunch, Captain Michael led us on an expedition to La Flor beach, just around the hill and through the woods from the beach to which Pelican Eyes brought us. La Flor is the destination of several different species of sea turtle. 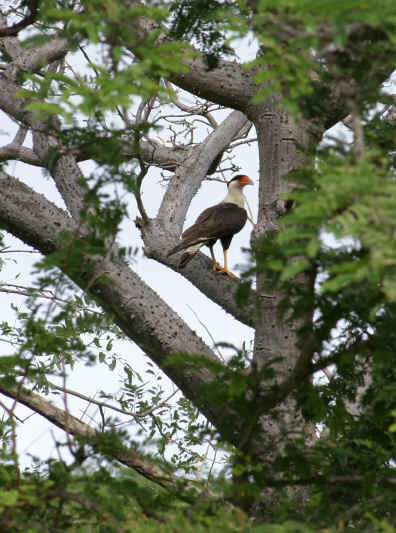 We didn't see any live hatchlings, but we did see a Caracara bird feasting on some of the dead ones. The beach itself is gorgeous, stretching in a half mile arc. We spent about 45 minutes there taking pictures and playing in the water. In San Juan del Sur, one of the deep water, Antarctic currents (the Humboldt Current according to one of the locals) comes close to shore and the water is cold, just perfect for a hot day. Meanwhile, Max was taking the opportunity to just relax a little . . .